Muon Sokmean, a 29-year-old garment worker, scrambled off Veng Sreng Street on January 3 with military police in violent pursuit, brandishing their batons. What had been a militant protest for a $160 minimum wage in the garment sector—with many protesters lobbing rocks and crude Molotov cocktails at military police—had devolved into a pitched battle on one of Phnom Penh’s main industrial boulevards. “I saw military police chase him into my restaurant and beat him with batons,” said Vy, 32, the owner of a restaurant on Veng Sreng Street, who declined to give her full name Monday for fear of her personal safety. “They kept kicking him once he fell down. He was really severely beaten,” said Vy. When Mr. Sokmean got up from his beating, he was disoriented and bleeding heavily from his head and one of his eyes, she said. On Saturday, Muon Sokmean passed away from the injuries he sustained on Veng Sreng Street, according to his family. The spokesman for the military police, however, said on Sunday that there is no evidence proving that his forces caused what would be the sixth fatality from the crackdown—five others were shot dead by military police. On that bloody January morning, Muon Sokmean eventually stumbled away from Vy’s restaurant onto the land behind the house belonging to her neighbor. That’s when Nou Sopheap, 38, saw him from her kitchen window. “He was so afraid,” Ms. Sopheap said Monday. Muon Sokmean was shaking uncontrollably when she ushered him into her house to keep him safe, she said. “If the police had come down that way and found him, he would have been finished,” she said. After a few hours, Muon Sokmean was finally able to speak and provide his wife’s phone number. 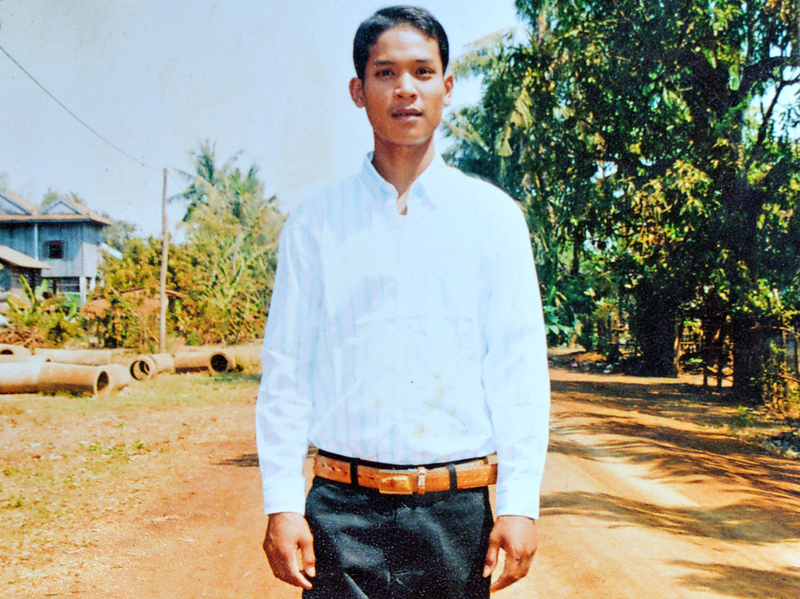 After his wife Pok Heam picked him up from the shelter of Ms. Sopheap’s home, the two of them left Phnom Penh for his family’s home in Kompong Speu province. It was only when local rights group Licadho came to visit soon after—with financial aid—that the couple could afford a visit to the Khmer-Soviet Friendship Hospital. A brain scan on January 6 revealed that Muon Sokmean had suffered a contusion from the beating, an injury that can possibly cause death months later if not treated properly. Muon Sokmean received treatment at the hospital for 20 days, at which point he was released and told to come back for tests if any symptoms—like headaches or vomiting—started to occur, according to his wife, Ms. Heam, a fellow garment worker. But despite experiencing bouts of headaches and dizziness, Muon Sokmean never returned to the hospital for further treatment. But even after his death, Ms. Heam said she supported her husband’s participation in the protests for higher wages, and wants authorities to answer for their actions. Brigadier General Kheng Tito, spokesman for the military police, said Monday that an investigation into Muon Sokmean’s death would only be launched if a complaint is filed by his family. “If there is no complaint, there will be no investigation,” he said. But Ms. Heam said she is too afraid to file a complaint against the same forces that she believes brutally ended her husband’s life.